While sending heart shape arrangements of flowers to share your loved ones can be considered one of the best forms of gifts, you should know that uniqueness is packed in every other gift available on this online gift portal. There is nothing more classic than sending a Heart-shaped Arrangement of Red Roses to a loved one. S..
Congratulate the newlywed couple with this beautiful heart shape red and pink colour rose bunch to d.. Nothing can express your feelings more than an exquisite gift of red roses. Make your special moment.. Sharing your love with your wife or girlfriend or romanticizing things to share your special love with them, it’s one of those beautiful things you can do to get a smile in return of your lovely impressive gifts. And in those romantic gifts, options are endless. This let you reach a situation when you can’t decide what to choose as the most perfect gift. But you can choose nature’s call as the theme of your gifts. Yes, it would be amazing to have beautiful arrangements of flowers as an incredible gift option. Particularly for your wife or girlfriend, the essence is much more felt if you choose heart shape arrangements. The best part is that you don’t have to scout through the market stores, looking for an impressive work of art by an expert florist. You can get it all easily & conveniently online at Gift My Emotions. Just imagine how hard it would be to choose the most impressive flower arrangements when you have work issues. 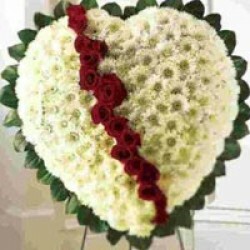 In spite of that, you can even send Heart shape arrangements available & beautifully arranged at GiftMyEmotions gift shop. You may or may not be choosy about any particular kind of flowers, roses, daisies, Gerberas or even mixed collection. So, it’s easier to send mixed flowers in distant parts of India through GiftMyEmotions as it provides free shipping services for every flower arrangement you choose from this unique online gift portal. You can even break the monotony of having just flowers for any occasion, for any special one or even otherwise by choosing gifts along with flowers available at GiftMyEmotions.com. There are chocolates, cakes etc. to make great combinations with flowers. And for all of these combinations, GiftMyEmotions provides services of cake delivery in Delhi. The geographical spread of Indian subcontinent is covered by the delivery services of GiftMyEmotions. So, whether you wish to send flowers to Bhubaneswar or to Bangalore, Mumbai or Delhi, you can send them all with the online flower delivery option of this portal now! While sending heart shape arrangements of flowers to share your loved ones through GiftMyEmotions.com can be considered one of the best forms of gifts, you should know that uniqueness is packed in every other gift available on this online gift portal. You can also have the options of choosing gifts like special gift hampers, send personalized gifts, gifts for him, gifts for her, gift with respect to the occasions & celebrated with great fervor which needs a special touch to be added to them in any sense. There are gifts for rakhi, Deepawali, Christmas, Father’s day, mother’s day etc. You can get gifts of all kinds at GiftMyEmotions.com. What Makes GiftMyEmotions Special As An Online Gift Portal? You generally desire unique forms of gifts that you can choose for several different occasions & festivals & share them with your loved one year by year. That uniqueness factor should be well preserved in everything you choose. And this is what GiftMyEmotions believes as it only offers nothing, but the most unique forms of gifts. So, choose gifts & flowers from GiftMyEmotions now!